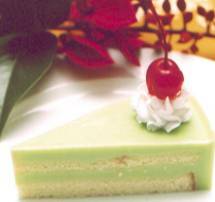 Use this delicious recipe for filling and frosting your Pandan Layer Cake. Stir and cook all the above ingredients over medium heat in a heavy-bottom saucepan till it thickens. Cool slightly (approximately 15 minutes) before spreading on cake. Makes enough for 2 layers of cake filling and frosting a 9-inch cake. *Note: Hoen Kwe flour is a pre-mixed pudding flour from Indonesia. Hoen Kwe comes in a variety of colors; if you use "green" Hoen Kwe flour, you definitely don't need to add the green food coloring to the mixture. 1. Use as frosting and filling. 2. Use as frosting and filling, then sprinkle all over the cake with (green, optional) dessicated coconut. 3. Use as filling. You may slice the cake into more layers. And frost with whipped cream. The filling that was made failed to thicken and stayed a watery consistency. Followed recipe to the letter. Will try again.